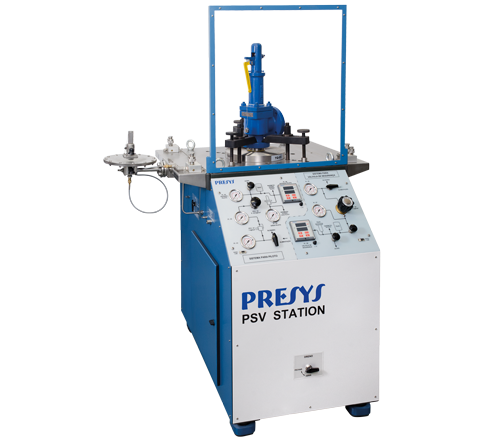 The Presys PSV Workstations are a family of transportable, compact, digital, and easy to operate stations for the testing and calibration of all sorts of Pressure Safety/Relief Valves in the range of ½" - 10" and up to 5000 psig (350 bar). 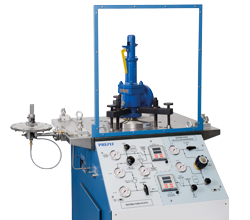 Presys PSV Workstations feature a unique digital registration system that allows the automatic detection of the set pressure and the reseating pressure. The Workstations communicate with the Isoplan® Calibration Software to produce complete documented calibration and test reports. Three models with maximum pressures up to 5000 psig. Low pressure system for pilot operated valves. Polycarbonate safety shield for operator protection. Accept threated and flanged valves up to 10". Bubble counter and adapter for leak detection and measuring. Communicate with ISOPLAN® to produce calibration and test reports. Compact Dimension: 1.22(h) x 1.00(w) x 1.30(l) meter, 450 kg, total height with protection: 1.90 m.
Skid-mounted for easy transportation or installation in containers. The set pressure and reseating pressure are automatically registered and display on the digital pressure registration system and can be send in real-time to the ISOPLAN® Software. ISOPLAN® calibration software allows you to record all your safety valves technical information and calibration operations in a strong database in order to meet your safety regulations. 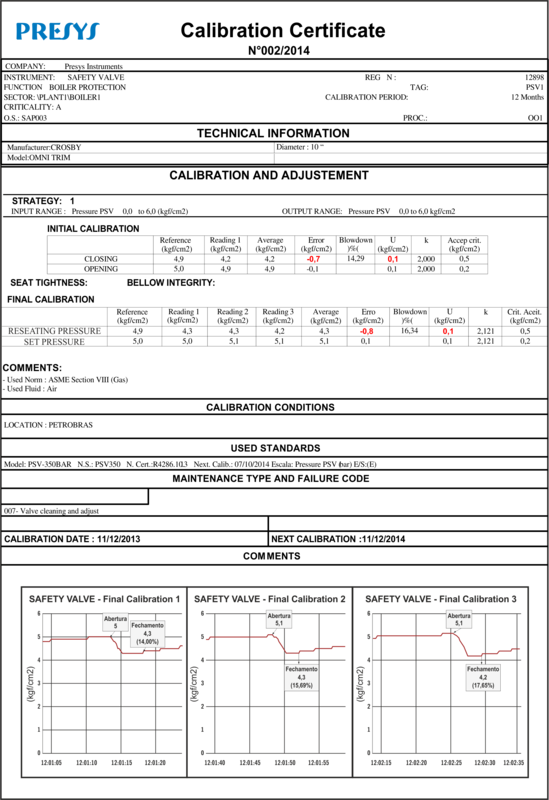 It will generate the full calibration report that will include the calibration graphics, calculation of blowdown, photos of the valve before and after maintenance as well as any technical relevant information. Presys PSV Workstation is delivered in a seaworthy packing and we provide installation and training on-site on request. Presys products are developed in a technology context combining high quality and reliability, using a continuous improvement process. With a global presence in most regions of the world, directly or with specialized and trained distributors, Presys provides you with the right solution for you application or calibration needs, always benefiting of our entire technical support.